The financial and related professional services (FRPS) sector is one of the most active and engaged in corporate community investment across the country with six out of the top ten contributing firms operating in the sector. 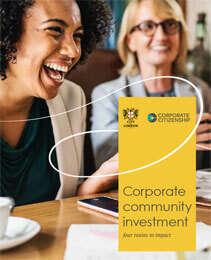 Corporate Citizenship’s latest research, in collaboration with the City of London, looks into the impact these programmes have on the causes, communities and people supported. As this research shows, there is still more to do – over two thirds of FRPS companies have no clearly defined strategy for targeting their activities to achieve the best outcomes.